Have you ever heard a loud bang or thump in the pipe when your toilet tank is filled and it shuts off flow, or when your washing machine fills up? It might even happen when you turn off a faucet. This noise is likely caused by water hammer. So, what is water hammer? Water hammer is the noise that water makes when it’s forced to stop or change direction suddenly. This noise is caused by a pressure wave from the water moving forward and hitting an obstruction, like a closed valve. This sudden stop creates a shockwave of energy that’s released as noise. The problem is, the energy also does other damage to your pipes, fittings and valves. There are two main contributors to water hammer: high pressure and nowhere for the water to release it’s energy safely. Valves that close suddenly, like those in your dishwasher, toilet and washing machine, are prone to water hammer because they stop the flow in a short space of time. Water hammer is more than a pesky noise. The pressure wave from the water is like a “hammer” hitting the insides of your pipe, connections and valves. This leads to leaks, burst pipes and failed valve seals. 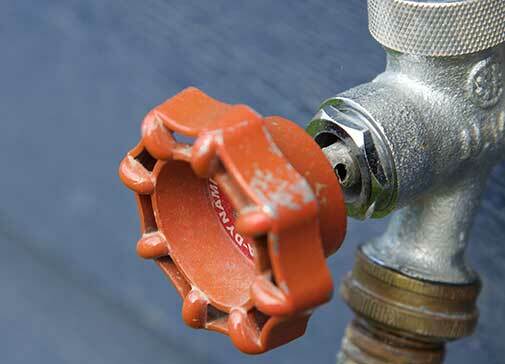 If you’re having water hammer throughout your home, it may be caused by excessively high supply pressure to your home. Installing a pressure-reducing valve (PRV) at the main supply to your house would immediately solve this problem. Depending on your system, you might have problems getting flow to your farthest fixtures with this low pressure. In that case, you may have to install a PRV closer to the problem fixtures only. If the pressure to your home isn’t the problem, you might have an issue with the piping itself.. When water has to stop flowing into your appliance or sink, it needs space to dissipate its energy. Plumbing systems usually have an air chamber, which is a vertical pipe filled with air that buffers the water when a valve closes. If it becomes water logged, the buffer disappears. Drain your system and clean the chamber to get air back into the chamber. Another option for reducing water hammer is to install a water hammer arrestor. This is a device with an enclosed air chamber to buffer the water’s sudden stop. It’s design prevents it from becoming water logged. These devices go on the piping to the specific fixture experiencing water hammer. If you need help assessing and fixing water hammer, give Allied Plumbing Service a call before it destroys your plumbing system!